Another week down, another 64 miles in the books. This morning concluded the training week with a 12-mile long run at the same beautiful bike trail as last weekend. But this morning I had some company! Four of us are running for our university’s now, each in a different state. 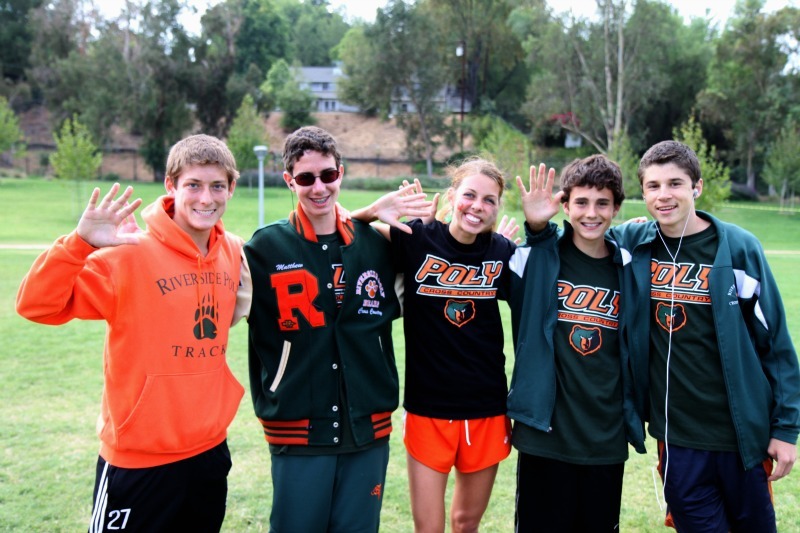 But during the summers, I have my old high school running buddies back! We each follow different training schedules per our coaches, however a long run on Sunday is pretty standard across the board. This morning, 4/5th’s of The Five reunited for an EARLY morning out-and-back on the Santa Ana River Trail. Unfortunately only two of us made it the whole distance; our pace has definitely quickened since high school. My friend Matt and I covered 12.1 miles in 1 hour, 27 minutes (approx 7:15 per mile). All before 8:00am. On a Sunday. I sense a nap coming soon….. This upcoming week’s training is not much different from the last two weeks, just increasing some mid-week days for a grand total of 68 miles. I plan to take full advantage of having 4th of July off work to get in a good one at the park! Message of the week =be flexible. Running partners cancel, some days your legs are tired, you have to stay late at work, the temperatures are hotter than you accounted for. That’s not to say these are excuses to skipping a workout! Flexibility means if the sun’s too harsh, use the treadmill. If you got to bed late, sleep in and plan a night run. If your legs are sore, cross train in the pool. As much as we like to plan things out, writing them down on a white board calendar does not necessarily dictate how they will play out. Fortunately I have a weekly mileage goal that keeps me from rolling over and going back to sleep when 4:30am comes and I don’t exactly hop up enthusiastically to get to my treadmill. Cardio before coffee?! Sometimes when I run before the sun is up and it’s totally quiet outside, I feel like I’m still dreaming. Trippy! Yesterday at Sprouts (I LOVE THAT PLACE) I bought chia seeds for the first time. After reading other blogger’s experiments with overnight oats, I’m so intrigued. I plan on making a batch tonight for breakfast tomorrow (which means saving time in the morning which means I can curl my hair. Double win!) Apparently the chia seeds are the necessary ingredient that changes the texture of the oats without cooking them. Magic? After leaving the office, I was on a mad-dash home. One of my best friends Bre came home from college and we were reuniting in our usual fashion: cooking. Bre and I have been cooking/baking/experimenting in the kitchen with both utterly-delicious and downright-ugly results since high school. On the top of our list: Strawberry Banana Oat Cookies. 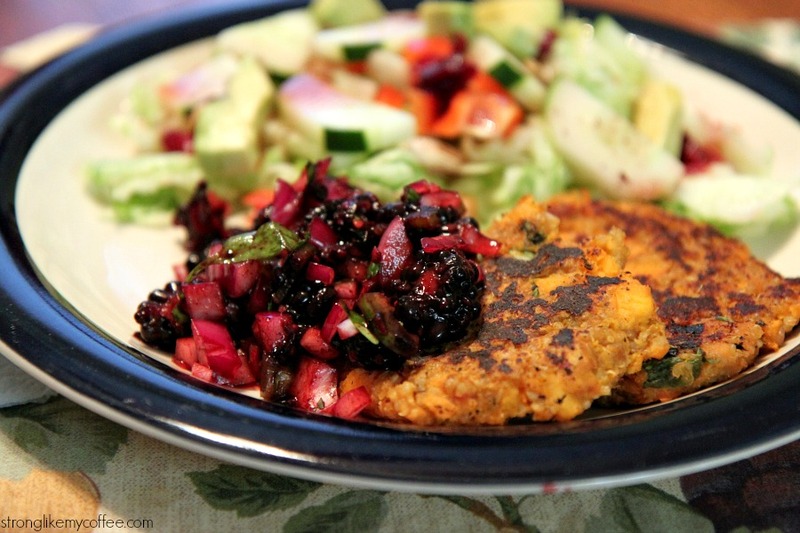 Last nights menu: Sweet Potato Quinoa Cakes with Blackberry Salsa. These are like a heartier version of a potato pancake, something that sounded totally new and different. They were inspired by Jessica @ How Sweet It Is, though I definitely had to triple the recipe since we had company! I love making new recipes almost as much as I love not getting a cup of espresso for my afternoon pick-me-up. I am really slow at preparing meals….it took me about an hour and 40 minutes from start to finish because I take chopping herbs all to seriously and am more cautious than necessary about measuring ingredients. I like to take my time! Most people could probably throw this together in half the time, and I promise it’s worth the wait. 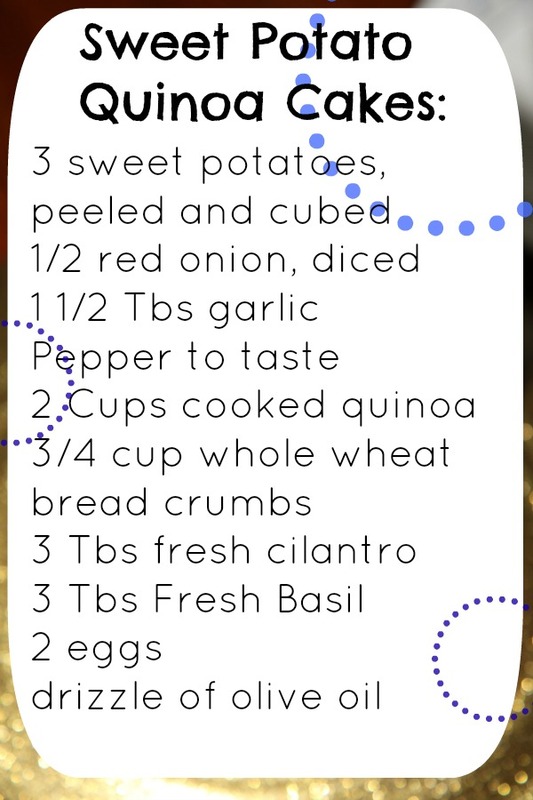 Here is the recipe! Makes 16 medium cakes, serves 5 1/2 hungry people. Drizzle 1 Tbs olive oil in a large skillet over medium-high heat; add cubed sweet potato, onion and pepper. Cover and cook for 15-20 minutes, until sweet potato is soft. Add garlic in the last minute. Remove potato mixture into large mixing bowl, and slightly smash the potatoes. Add the cooked quinoa, fresh chopped herbs, bread crumbs, more salt and pepper if you wish, and lastly the eggs. Get your hands dirty and form hamburger-sized patties. Using the same large skillet, heat up a drizzle of olive oil again and place 2-4 patties at a time. Cook for approximately 5 minutes on each side, until you get nice black grill marks. Serve them fresh out of the pan! Admittedly I thought Blackberry Salsa was a little random but went with it. Not bad! 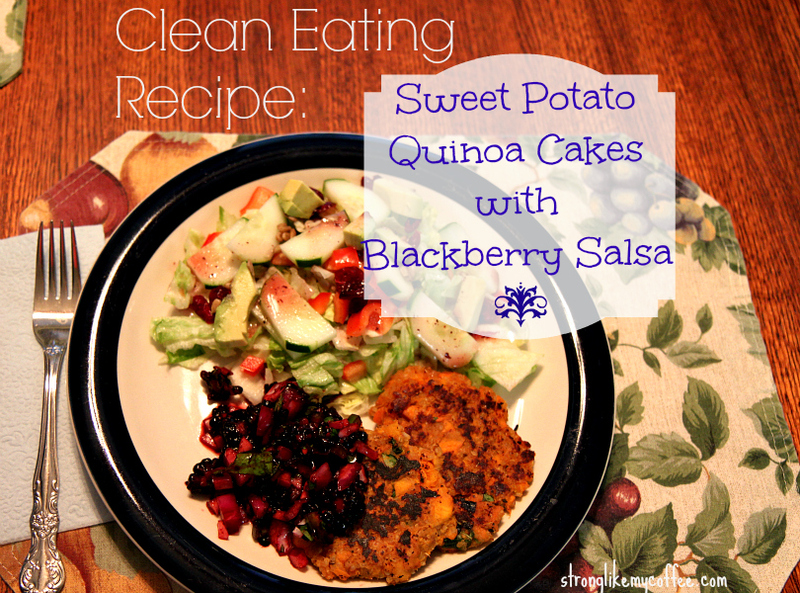 I don’t think the cakes needed any sort of sauce, and blackberry salsa would be better suited for blue corn chips but it’s always fun to try something new and it definitely made the plate look pretty. 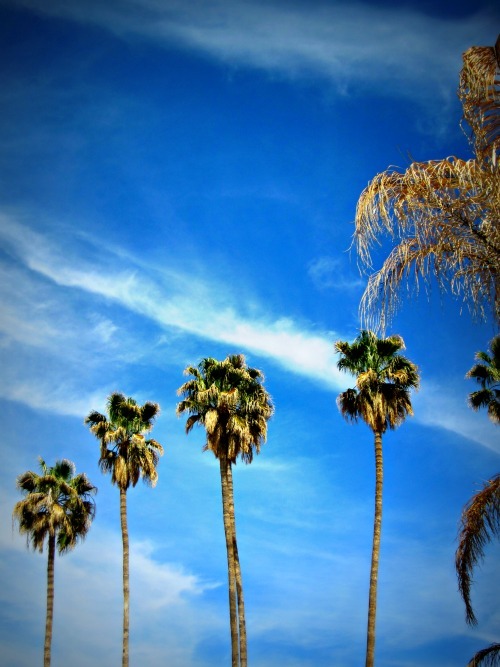 Check out Jessica’s original post here! Last tangent: who watches The Voice? I know I’m a little behind, thanks to Tivo, but YAY for Danielle Bradbery! I think America is starting to get the country-bug which is Stinkin’ Awesome. Yeehaw y’all!